There has been recent interest in the news lately on a report by the liberal activist group Toward Freedom around what has been dubbed the “Playstation War.” It describes how the demand for a key metal used in the Sony Playstation 2 video game console was a driving force in the ongoing wars in the Democratic Republic of Congo (DRC). Stories about the demand for this metal, called coltan, and the wars behind it in sub-Saharan Africa, are nothing new (1). What is new about this report is that it links one specific consumer product to this conflict. The Playstation video game console, like others on the market, is solely used for leisure and entertainment. Priced for hundreds of dollars and purchased by consumers in Amerika and other First World nations, the Playstation is a byproduct of the leisure time and disposable income available to Amerikans. Along with the console itself there are thousands of video games that are made for it, along with fan magazines and websites. According to the Entertainment Software Association video game sales reached $9.5 billion in 2007, and tens of thousands of people are employed in this industry to meet consumer demands (2). The indirect economics in terms of research and development, sales, advertising, and marketing are also vast. Video games are just one byproduct of imperialist parasitism, and in the case of the Playstation it is a direct contributor to war and suffering. Imperialism is a system based upon exploitation and war. 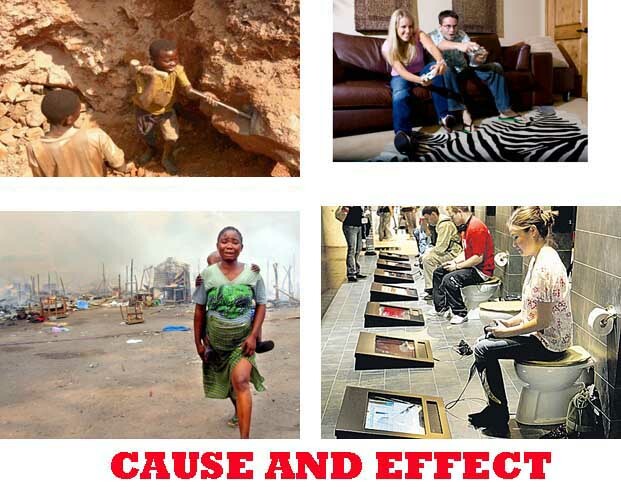 The production cycle of the Playstation illustrates the rabid bloodshed and exploitation imperialism brings, and the parasitism that it feeds in the core imperialist nations. “Kids in Congo were being sent down mines to die so that kids in Europe and America could kill imaginary aliens in their living rooms,” said British politician Oona King, who was a Member of Parliament from 1997 to 2005.”(3). Coltan is used to make the metal tantalum, which in turn is used to make capacitors for tiny electronic devices. Up to eighty percent of the world’s coltan reserves lie in the DRC (4). Hundreds of millions of dollars worth of this metal has been stolen from the DRC during this war in order to satisfy the growing demand for electronic items like cell phones, laptops, I-Pods, and video games. Sony of course engages in plausible deniability, saying it cannot really know where everything it manufactures comes from. Really, gee whiz. The DRC has one of the lowest per capita incomes in the world, despite being so rich in mineral resources. The cause of this contradiction is its long history of being a victim of imperialist intervention. It has long been a site of theft, plunder, and murder by U.$. and Western imperialism. It was once known as the Belgian Congo, named after its former colonial strangler. It achieved independence from Belgium in 1961. Its first leader after independence was Patrice Lumumba, who described 80 years of colonial oppression as a “humiliating slavery which was imposed upon us by force” (5). Lumumba, a national leader too independent for U.$. imperial interests, became a victim of an assassination orchestrated by the CIA and Belgian intelligence shortly after he took power. He was replaced by a subservient kleptocracy led by Gen. Joseph Mobutu, head of the national army. Mobutu and his cronies went on to steal billions from the nation he renamed Zaire, while starving millions of its citizens. Mobutu also allowed the CIA free use of the country as a proxy to destabilize the rest of the region for U.$. interests against the USSR during the Cold War. After the Cold War ended Mobutu was of no use to the imperialists, and was finally overthrown in 1997. His replacement also became a pawn of the imperialists. The nation, renamed the Democratic Republic of Congo, was led by president Kabila, who made deals with Western and Amerikan mining companies for access to its valuable mines. He had the backing of neighboring armies who wanted in on its resources. The five-year war that officially ended in 2003 was known as the African World War, the deadliest war since World War II. So far over 5 million people have died as a result. This is just one symptom of the long legacy of imperialism in this region. Like almost all consumer products, the Playstation and other electronics are manufactured in Third World sweatshops that take advantage of cheap labor and few regulations. The report states the iPod Nano is assembled in a five-story factory that is secured by armed police officers. The super-slim digital music player is said to include over 400 parts which arrive from component manufacturers all over the world (8). Amerika’s economy is a service economy. The wealth of this country comes from the exploitation of resources and labor from outside of its borders, all so Amerikans can live overly comfortable lives. The Playstation is no exception. Millions have died and billions suffer for your entertainment. The world’s majority won’t stand for it for too much longer. Amerikan imperialism will lose in the end. So join with the world’s oppressed majority and become a revolutionary anti-imperialist. It’ll be more fun than your Playstation anyway! 3). Lasker, John. “Inside Africa’s Playstation War.” Toward Freedom, July 08, 2008. http://towardfreedom.com/home/content/view/1352/1. All info on the DRC and Playstations, except noted, is from the Toward Freedom article. Next Post Remember Oscar Grant: The Struggle Is Not Over!